Prickly Lettuce (Lactuca serriola) is a dicot weed in the Asteraceae family. In Victoria this weed first evolved resistance to Group B/2 herbicides in 2009 and infests Spring Barley, and Wheat. Group B/2 herbicides are known as ALS inhibitors (Inhibition of acetolactate synthase ALS (acetohydroxyacid synthase AHAS)). Research has shown that these particular biotypes are resistant to chlorsulfuron, and metsulfuron-methyl and they may be cross-resistant to other Group B/2 herbicides. Greenhouse, and Laboratory trials comparing a known susceptible Prickly Lettuce biotype with this Prickly Lettuce biotype have been used to confirm resistance. For further information on the tests conducted please contact the local weed scientists that provided this information. There is no record of differences in fitness or competitiveness of these resistant biotypes when compared to that of normal susceptible biotypes. If you have any information pertaining to the fitness of Group B/2 resistant Prickly Lettuce from Victoria please update the database. Riar, D. S. ; Burke, I. C. ; Yenish, J. P. ; Bell, J. ; Gill, K.. 2011. Inheritance and physiological basis for 2,4-D resistance in prickly lettuce (Lactuca serriola L.). Journal of Agricultural and Food Chemistry 59 : 9417 - 9423. Experiments were conducted to determine the inheritance and physiological basis for resistance to the synthetic auxinic herbicide (2,4-dichlorophenoxy)acetic acid (2,4-D) in a prickly lettuce biotype. Inheritance of 2,4-D resistance in prickly lettuce is governed by a single codominant gene. Absorption and translocation were conducted using 14C-2,4-D applied to 2,4-D-resistant and -susceptible biotypes. At 96 h after treatment (HAT), the resistant biotype absorbed less applied 2,4-D and retained more 2,4-D in the treated portion of the leaf compared to the susceptible biotype. The resistant biotype translocated less applied 2,4-D to leaves above the treated leaf and crown at 96 HAT compared to the susceptible biotype. No difference in the rate of metabolism of 2,4-D was observed between the two biotypes. Resistance to 2,4-D appears to originate from a reduced growth deregulatory and overstimulation response compared to the susceptible biotype, resulting in lower translocation of 2,4-D in the resistant prickly lettuce biotype..
Burke, I. C. ; Yenish, J. P. ; Pittmann, D. ; Gallagher, R. S.. 2009. 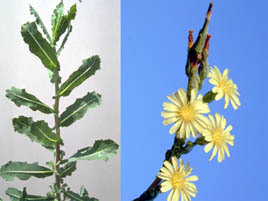 Resistance of a prickly lettuce (Lactuca serriola) biotype to 2,4-D. Weed Technology 23 : 586 - 591. Dose-response experiments were conducted on a biotype of prickly lettuce collected from Whitman County, WA, to determine the level of resistance to 2,4-D. Initially, progeny of prickly lettuce that survived two applications of glyphosate and 2,4-D in mixture were collected to determine if antagonism of the 2,4-D or glyphosate was occurring. Prickly lettuce survival was determined to not be due to antagonism of 2,4-D or glyphosate when the two herbicides were applied in mixture. The doses required to reduce growth 50% (GR50) for resistant and susceptible field-collected prickly lettuce were 150 and 6 g ae/ha 2,4-D, respectively, indicating the resistant biotype was 25 times more resistant to 2,4-D than the susceptible biotype. The resistant biotype expressed injury but produced regrowth following application. A dose of 2,4-D at 220 g/ha was required to reduce regrowth frequency 50% (FR50) for resistant field-collected prickly lettuce. Regrowth was also observed with the susceptible biotype, although the FR50 was much lower (10 g/ha), resulting in an R/S ratio of 22 based on the respective FR50 values. A rate of 4,300 g/ha 2,4-D (10 times the maximum labeled rate in wheat) was required to reduce the regrowth frequency in the resistant biotype to zero..
Lu, Y. Q. ; Baker, J. ; Preston, C.. 2007. The spread of resistance to acetolactate synthase inhibiting herbicides in a wind borne, self-pollinated weed species, Lactuca serriola L. TAG Theoretical and Applied Genetics 115 : 443 - 450. Resistance to ALS-inhibiting herbicides in Lactuca serriola first appeared in the northern Yorke Peninsula in South Australia in 1994, with resistance soon observed at a number of additional sites. The rapid appearance of resistance at many sites could be attributed to a number of independent selection events or to movement of resistant seed from the original field. ISSRs were used to genotype plants collected in 1999 and 2004 from roadsides or fields in an attempt to determine the importance of these two factors in the spread of herbicide resistance in L. serriola. In 1999 and 2004, chlorsulfuron-resistant L. serriola plants were found in both fields and roadsides with resistant plants being more frequent in fields than roadsides and more frequent in 2004 than in 1999. Genetic relationships generated using UPGMA analysis indicated the presence of more than one genotype within the herbicide resistant populations sampled for both years and suggested independent selection as well as movement of resistant seed had occurred. DNA extracted from samples collected in 1999 was used to sequence a highly conserved region of the ALS gene that coded for a single amino acid modification within the gene. Four different mutations were identified within the resistant samples and these mutations tended to cluster on a geographical basis. Together these data provide evidence for both multiple independent evolutionary events and for the potential movement of individual genotypes as far as 43 km in the region..